Attendees: Alison, Irene, Mark, Gail, Dorothy, Phil, Linda, Shirley, Jackie, Denise and Chris. 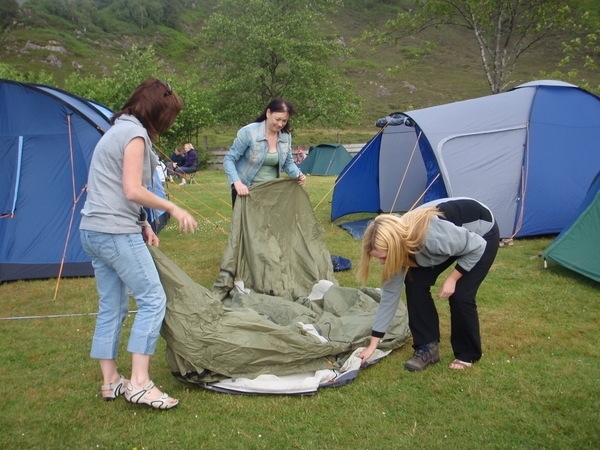 When Phil and I arrived at the Glenshiel campsite the girls were already busy erecting tents and sorting out the important things like: who?s got the corkscrew? Who?s got the wine glasses? Where?s the coolbox? Tents were pitched in record time and beds blown up, well nearly blown up, ready for when we got back from pub. 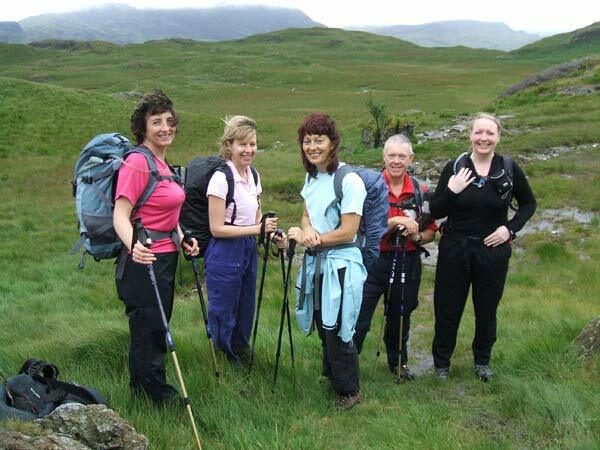 Linda and Shirley appeared now, fresh from the luxury of the Ratagan Hostel. They drove us over to the pub for our dinner. Mark and Chris joined us later. We got chatting to 3 retired firemen from Merseyside who would be doing the walk tomorrow too. It was their second time so we thought ?it can?t be that bad if they came back again this year!? Hmm, I guess all that smoke does something to the brain. They had also walked from Land?s End to John O?Groats, sleeping on fire station floors, and they also had walked across Spain. Alarm bells should have started ringing in our heads by this time! Anyway this was my first time camping and I was as excited as a child at Christmas. I woke up at 5.30 am with the rain battering off the tent. Great start! At 6.30 I was having some cereal at the side of the car, fighting off the midges. Didn?t they realise they are not supposed to like the rain? Not this clan of midges! They just put on their waterproofs and bit harder. 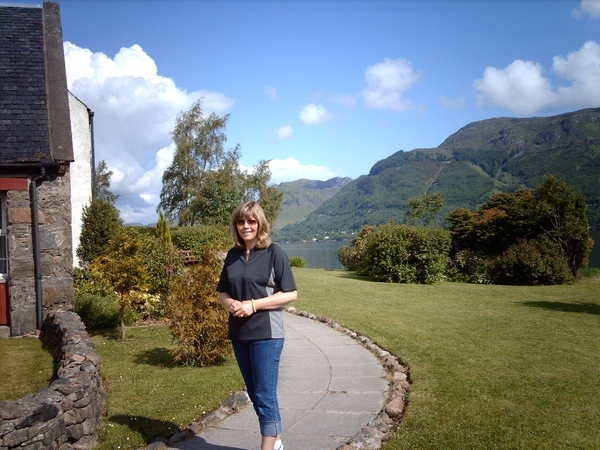 After a hair raising bus run over a narrow, winding road which took us to the top of Ratagan Pass with great views of the Five Sisters before plummeting down into the lovely village of Glenelg, which is situated in the bay looking over to Skye, we filed into the village hall to register. Hot filled rolls and tea and coffee were served by very pleasant local volunteers. The eleven of us were still relatively happy at this point. At 9am the organisers called us all out for the opening speech and the start of the Challenge. Lo and behold, the rain had stopped and the sun was trying hard to burst through a rather watery sky. 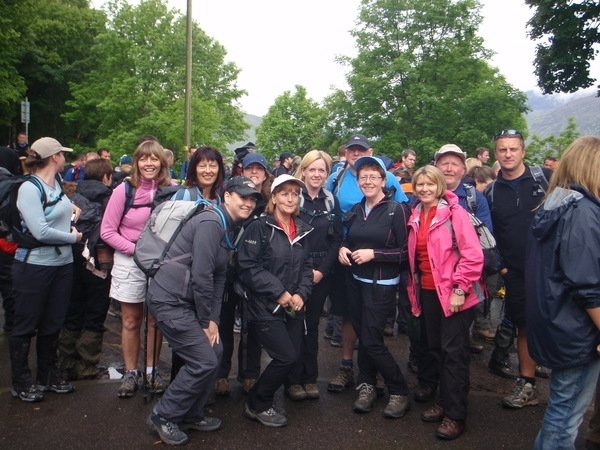 Once we started, there was a bit of a bottle neck as 200 plus walkers tried to find a comfortable walking pace. We followed a good track which took us along the side of the bay and then along the edge of a forest before coming back on to a shingle beach. Before we knew it, we were at Ardintoul, our first checkpoint. I was on my own at this point as Irene, Mark, Chris and Phil were ahead and the others were not too far behind. I had thought we would all wait and meet up at this point but it was impossible to wait around as the midges had their own challenge: Bite as many walkers as possible. But at least it had stayed dry and the sun was out, giving us lovely views out over Loch Alsh. Back on the road again, it was in and out of the forest and through some real boggy bits, there wasn?t much to see which was just as well as we had to watch were we put our feet. I caught up with Irene, Mark, Chris and Phil at this point as Chris wasn?t feeling too great, but after a wee rest, he slowed down for a while and was soon fine again. 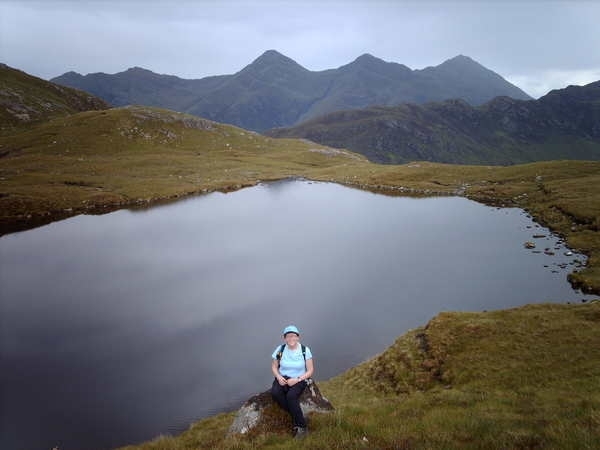 We then reached the next checkpoint, Totaig. 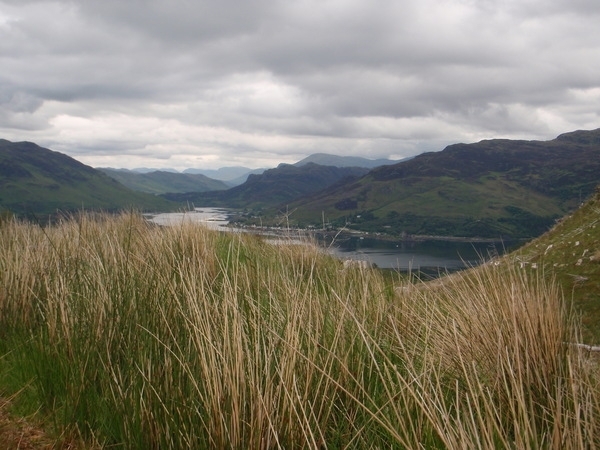 Totaig sits at the confluence of Loch Alsh, Loch Duich and Loch Long. From here we had great views of Skye Bridge and of Eilean Donan Castle, the most photographed castle in the world. It was hard to stop here too as midges still biting but Irene and Mark sat on bridge for a quick snack while Phil and I walked on for a bit then sat on some rocks overlooking Loch Duich. We then walked on to Letterfearn village where two lovely young girls had set up a table with jelly beans, jelly babies and other sweets along with cold cups of juice. This is known as the Jelly Bean Stop. It was great. Just a wee bit further on, Mark, Irene, Phil and I sat down on a grassy section at the side of the road when a lovely lady came out of her house with a tray of cold juice and some chocolate digestive biscuits, it was a lovely treat. She even let us use her toilet. Highland hospitality at its best. After a well earned rest we headed off again and eventually arrived at Shielbridge, our next check point. 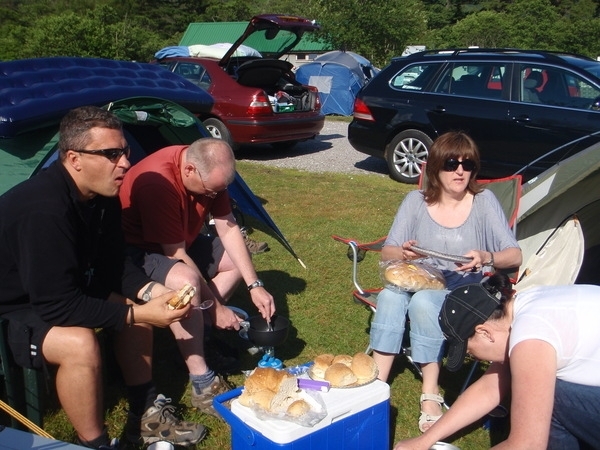 As this was our base camp, we decided to have our lunch and a decent rest so we lit the stoves and got the chairs out. Then the rain came on! Some folk decided to put on their waterproofs and just go for it but not us. After about fifty minutes we decided to pack up and get back on the road. Just as we did that, the rain went off and the sun came out again. Alison, Irene and I were last from our group to leave the campsite and everyone else was out of view. Now came the bit we were dreading: THE HILL. It started off quite steep as soon as we left the camp, the sun may have been out but it was still very muggy. We were just glad the rain had stopped though. When we got to the top of this steep part we were hoping that the worst part was over, but after a wee flat bit we had another huge uphill climb. 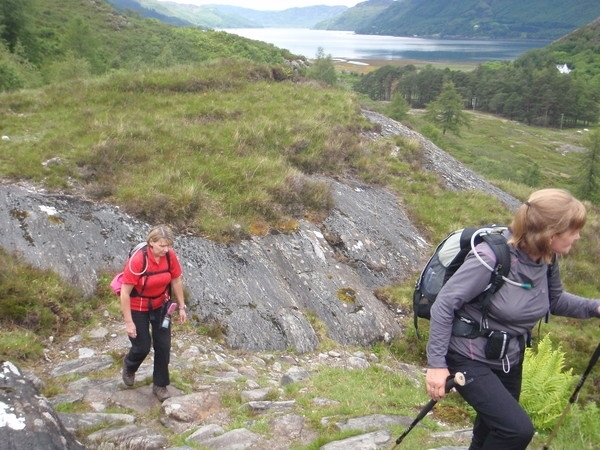 This was a real killer and was quickly followed by a real knee crunching descent over loose stones and rocks. Shirley had hurt her foot on the way up and was really struggling on the descent. This is where Irene seemed to have a new lease of life and in no time she was up that hill and last seen jogging down the other side. We had some lovely views and I still managed to take some photos despite the tiredness which was creeping in. Just at the end of the forest we reached the next checkpoint, Moyle. We let the marshals know that Shirley was struggling a bit and that they weren?t to go away before she got there. She was determined to continue, despite the pain. We didn?t stop here, we just kept on going until we reached to open hillside and sat down for a 15 minute break in glorious sunshine. Linda shared her jelly babies and Jackie and Denise shared their jelly beans. Simple things were very much appreciated today. Fully refreshed, we started back on our way again and at this point we were still laughing and chatting together, apart from Mark and Chris who we hadn?t seen since leaving Shiel Bridge, and Irene who had zoomed off earlier. To the rest of us, time had no meaning today, we walked between checkpoints. Our only aim was to get to the next checkpoint. I don?t think we even looked at the time all day. That is probably why when we saw two Hi Vis vests in the distance we thought we were almost at the last checkpoint with only five miles to go. 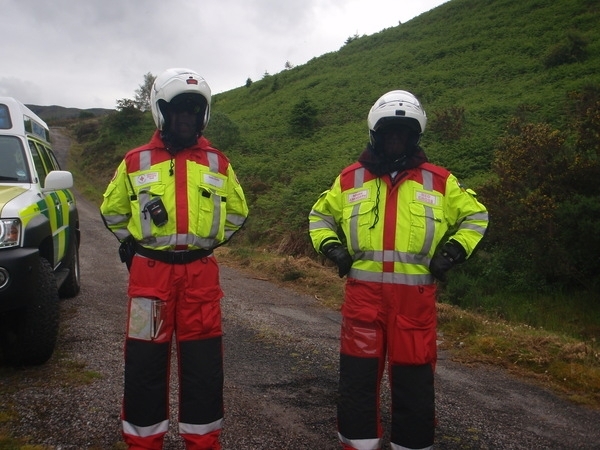 We were so disappointed when we got to them and discovered it was two paramedics with quad bikes. When they said we had 7 miles to go, I wanted to cry. I was devastated, we all were. Although it was only 2 miles more than we thought it was. It was a very quiet bunch who continued on the path to the last checkpoint, Balvraid. This is where we found a new lease of life. We knew it was 5 miles and if we could keep up a pace of 3mph, then we could be finished in less than 2 hours. We had our Ipods on by this time and conversation had dwindled away. It was a good tarmac road so we kept a good pace, two young teenagers were kind enough to leave out tumblers of nice cold water for us at the side of the road. As we trundled along the side of Gleann Beag towards the ruins of the two Brochs: Dun Trodden and Dun Telve, I tried to fire up some conversation by telling the others a wee bit of the history of the brochs and that Dun Telve is the second best preserved Broch in Scotland. Well, I was cut off mid stream, by Alison telling me bluntly what I could do with the Brochs. We did have a good laugh at this, seems history lessons and sore feet don?t mix too well. Soon after this, we thought we might have about 2 miles left to walk when we saw a road sign up ahead. When we reached the sign and read Glenelg 1? miles, we whooped and cheered. Somehow this gave us a new lease of life and we walked faster. 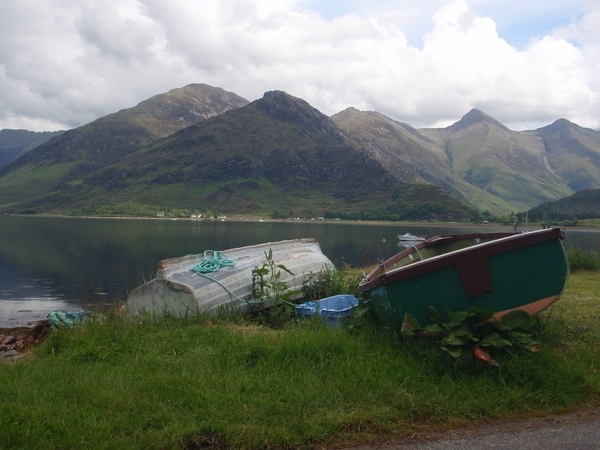 Then Glenelg Bay came into view and we could see civilisation. We were elated, not long to go now: 10 minutes, 5 minutes, it was nearly over. Just about half a mile from the village hall, we came to a sign pointing us away from the flat bay road and UP A HILL!!!! We were going round the back of the village, do we have to enter the village hall by the back door? Then suddenly we were directed back DOWN HILL and onto the main road again, but by this time we were past caring, we could see the village hall. At last we were there, as we walked in through the door, we were greeted by a loud cheer and lots of clapping. It was a fantastic feeling. We registered our time and collected our certificates. 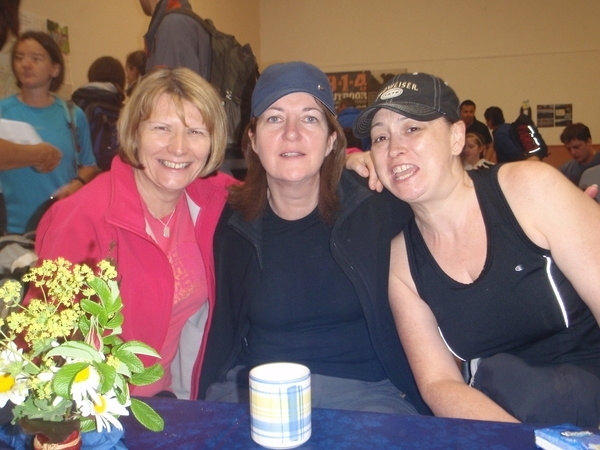 There was tea, coffee and food available but most of us could only drink some lovely cold tap water. I had to go to paramedics for anti histamine cream as my legs were very red and swollen. I am not sure what caused this as I had long trousers on and hadn?t been bitten. Irene, Mark and Chris had managed to go to the pub for a drink after registering their time. We wanted to wait for Shirley to come in as the marshal said that she was less than a mile away. Unfortunately our bus couldn?t wait any longer and we had to make our way back to camp. It was straight to our tents and into sleeping bags except for Shirley and Linda who went to the Glenelg Inn to celebrate. It must have been the quietest campsite in Scotland that night. We woke up to a lovely sunny day. We set up our chairs and stoves and fried sausages provided by Jackie and Denise, (oh how welcome and appreciated they were) thanks girls. 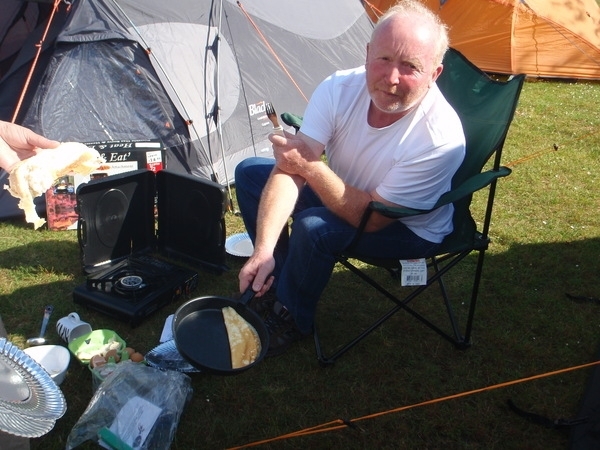 Phil showed his expertise at making omelettes, (not practised at home, I must add). It may not seem like much, but to us it was a feast. Before too long it was time to pack everything up and head off home. I think we all agreed that it was the hardest thing we had ever done. It was a real challenge and we all felt very proud of our achievement. 30 miles might not seem much but think of it this way: imagine walking from Irvine to Darvel, then climbing a hill, (maybe on a par with Loudounhill) then walking back to Irvine.